The Westfield Fountain Gate web site’s advice for getting there by public transport has a list of the buses that serve the centre (the list being out of date — the 826 and 794 don’t exist anymore and the 839 and 840 no longer go there) and notes it’s a fifteen minute walk from Narre Warren station. Jeremy and I did indeed head down there by train yesterday. At the station we checked the bus timetable; it was twelve minutes away, and if the walk was going to be only marginally longer, we thought we might as well walk it. The central bit of Narre Warren, around the station, is relatively pleasant to walk around. But what Westfield have created is an extremely pedestrian-hostile environment. It’s not very far (as the crow flies), but the route is badly signed and confusing, you end up crossing numerous roads and car parks, there’s little cover — it must be horrible if rainy or hot. Even if you check the map in advance, which I did, and work out that following Webb Street from the station is the logical way, the only visual clue along the way, a huge “Westfield Fountain Gate” sign entices you off instead to the main car entrance on the Princes Highway. We followed this, which meant the trip was longer and more convoluted and confusing than necessary. In the end, it’s true that it probably was a fifteen minute walk. But it was the worst kind of walk — the one where you’re not really sure where you’re going, nobody else is around, and at one point we were following a dirt path apparently worn by previous pedestrians into the grass, because Westfield had failed to provide a proper footpath. The centre itself is a mishmash of separate buildings. 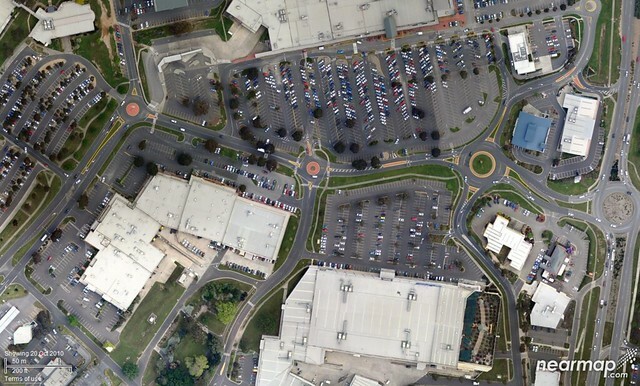 It’s unclear how much is controlled by Westfield and how much isn’t, but as it is, I bet some motorists drive to one part of the centre, do shopping at Officeworks or Harvey Norman and then get back into the car and drive to the other, main part of the centre. I considered us catching a bus back to the station, but having not checked the route numbers in advance, and the mobile Journey Planner revealing few clues as to the waiting times (as most people know, outer-suburban bus services are pretty appalling on Sundays), I decided it was easier to walk back. Just as well; it appears the 841 bus would have pulled into the station just as the train departed — yet again showing Victoria’s mastery of bad train/bus connections. We walked back along Webb Street, almost getting lost on Narre Warren North Road, which doesn’t even have a footpath along some of its west side — again, there were no visual clues, no pointers to the railway station, not even a street sign for Web Street that I could see. Often in transport they talk about “balance” and “choice”. In this case, you’re given little choice. Walking and PT access have been made so awkward that almost nobody would use them by choice. Woe betide if you can’t drive, if you’re too young or two old or have a disability. I would imagine trying to get here independently in a wheelchair would be absolute hell. Perhaps nothing can be done in a hurry about the overall design of Fountain Gate, but a lot more could be done in terms of signage, between the centre and both the bus interchange and the station, and better pedestrian footpaths to both. It’s not hard, it just takes a little thought. You would think they’d want to encourage any visitors who might be inclined to come without adding to pressure on the carpark… but maybe they just haven’t thought about it. It’s really no wonder that in this part of the world, the car is king… despite all the problems that brings. It’s like a case study in bad urban design — with the apparent cooperation of the Department of Transport, who back it up by unusable bus services. On the bright side, we found what we were looking for while down there, we did get some good exercise, and it was perfect walking weather. And actually, if you get a good connection, which we did on the way down, the travel time from Bentleigh isn’t excessively higher than by car — a bit over an hour. Always interesting to hear the view from an outsider. Melbourne: A Pedestrian Paradise from STREETFILMS on Vimeo. I don’t think I disagree with any of the praises given, and there’s some interesting comments from Robert Adams and others about some fairly subtle design features that have gone into the streetscapes, such as the City Council being more interested in the presence of a footpath flower seller at night (to add to safety) than the rent he pays. But just note that this is central Melbourne. Middle and outer suburban Melbourne is quite different. Some parts are the antithesis of what you see here. At 2:30 in the background you’ll note a feature of Melbourne’s streets that they don’t mention — Charity Muggers.